It's hard to believe an entire decade has elapsed since Princess Diana's death. I remember that night well. 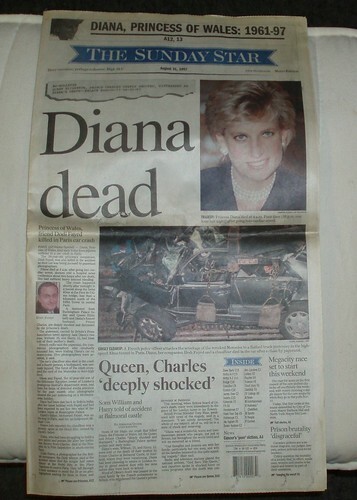 I stayed tuned to the coverage as the reporters speculated as to whether Diana had survived or not. I remember hearing the announcement that she had passed at which time I called Taryn to tell her the sad news. I remember Taryn being really upset and then moments later my mom calling to share her shock. Without a doubt, it was an iconic event. I may not have been a Di watcher, but I recognized her as the most photographed woman in the world and I was sure to keep a copy of the next morning's paper.